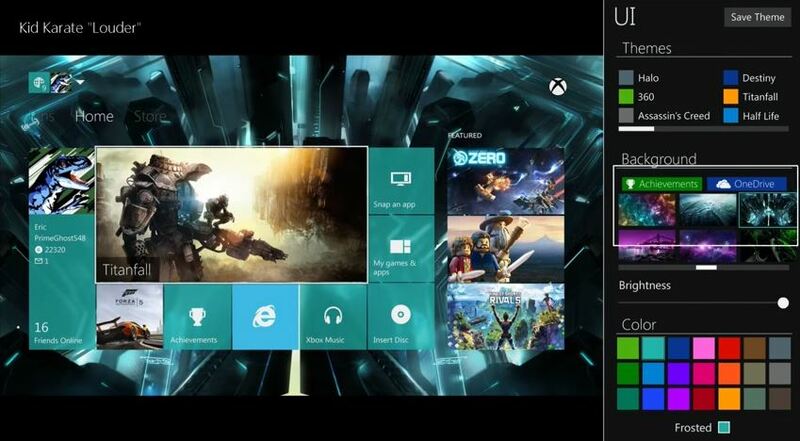 A video of the Xbox One interface seems to have caught the eye of Microsoft as Major Nelson has shared it indicating that it was a great job and that he had shared. This is a good opportunity for amateur (PrimeGhost548 his nickname) to become known. In this test, it is to imagine a further customization of the interface of the console where it is rather limited today. The bottom of the screen brightness through the color of the tiles, everything is there. Face it, we would like to have all these opportunities in a intuitive interface that seems like it! Microsoft is one of the companies filing the most patents and domain names every year across the world, so it's no surprise that two domain names associated with the Xbox were discovered. Simultaneously deposited yesterday and XboxAb.com XboxAb.net still lead on any website, it is impossible to know for what purpose they were created. The Redmond company had already given us the same time last year before the revelation of the Xbox One, then a few weeks before E3 registering domain names we have never heard of. It is therefore possible that the giant confuses just a little more than a month of the great mass of the video game in Los Angeles, but it could also be a new service for our Xbox One. Only the future will tell us what it is. 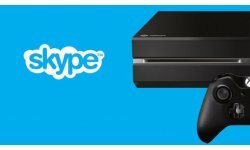 The Skype application is available on Xbox One since the release of the console in November last year, but to receive group calls, should pay €4.99 per month to unlock this feature. Only Gold of Xbox Live subscribers were able to enjoy free video group, since this service was offered them for 6 months. Now, no need to proceed to checkout, group calls are free for owners of Xbox One, as for those of PC or Mac. This will therefore discuss up to ten simultaneous unrestricted platform. Indeed, with your console you can talk with your correspondents, regardless of their favorite machine. In addition, thanks to the camera and the microphone of Kinect, you can participate in visio-conferences without the need of a helmet. How about you? 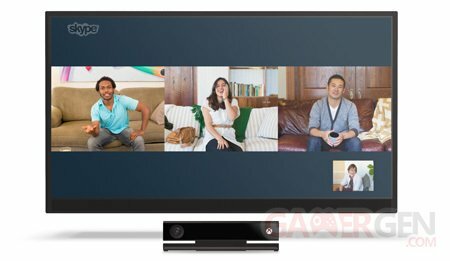 Do you already use Skype on Xbox One to communicate with your friends? At the end of April, most businesses close their quarterly balance sheet and thus yield some interesting results. Microsoft has of course no exception to this rule. 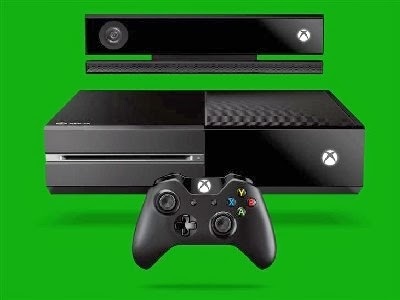 If financially the company pulls out of the game, however it seems that the Xbox One is not rosy. 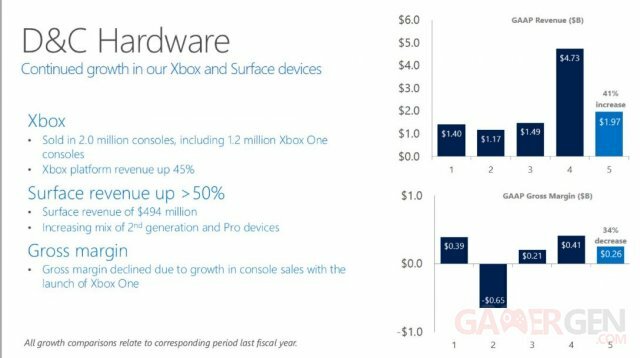 After announcing 5 million consoles shipped to dealers, Microsoft has revealed in its balance sheet only 1.2 million units were sold in the quarter ( January 1 to March 31). Although the first week of launch and the Christmas period generally represent many sales that are not included here ( more than 3 million to believe Microsoft) , traders still have large stocks in their reserves. Confirming that a hint , Amy Hood, CFO of Microsoft, announced that the company will " continue on a part of its stocks " on the next quarter. This can be interpreted by a pause of production in order to sell the remaining surplus and allow everyone to make an inventory of the remaining parts . Besides that , the production will have to soon start over again with the release of the console in various countries, including Japan. For the record, the newest Microsoft is only available in 13 countries now and still has everything to prove. It is therefore not draw hasty conclusions about its current status . Michael Pachter: "If there is a PS4 $ 349, Microsoft will have a real problem"
While Michael Pachter, the famous analyst for Wedbush Securities, we love to hate, banked heavily on the Xbox One before the disastrous communication from Microsoft, the latter returns today a little his jacket. In an interview with GamingBold, he said that it will be difficult for Microsoft to release his pack with One Xbox Kinect: "I don't think it necessary to argue about the weakness of the number of Microsoft First-Party games, because most games Sony's First Party who are seen as successes are not huge sales. I think that eventually, the Xbox One to succeed, Kinect must be separated, and I think that it could be difficult, because there are a lot of things that use the hardware where everything is integrated, and this could not work". 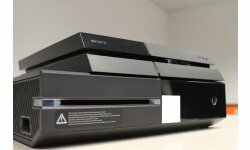 Pachter also adds that if Sony decides to lower the price of its console, Microsoft would end up potentially in a delicate position: "but I think that you'll probably a console redesigned in 2015 that does not include Kinect and that would accelerate the process if Sony drops the price of its PS4: If a PS4 $ 349 (€349) on the market.Microsoft will have a real problem. He will have to do something, and he must do it quickly. 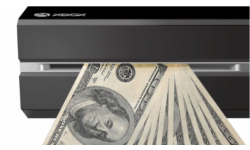 I think that in 2015, you'll see a PS4 to $349, and a decoupled One Xbox's Kinect, and if you see both for $349, the client wins, and both machines will sell very well. Microsoft does not seek to lose this round. What do you think? Are you his opinion? Xbox Originals: the next series TV Xbox details! At the very beginning of month, we already told you that Microsoft had 6 TV series in preparation, including one of them devoted to Halo. Today, Microsoft gives a little more details on its program and announces the beginning of hostilities in June. These are various comedies, documentaries, animation films and even live events that will only be available on Xbox 360, Xbox One or other Microsoft devices. Each program will provide interactive opportunities so, we are told, to get experience found nowhere else. A television series Halo: the television series Halo is an original series based on the franchise well known in the video game world. Steven Spielberg will produce this live-action series was created in partnership with 343 Industries and Amblin Television. Every Street United: "Every Street United" is a series of 8 episodes of 30 minutes and a last final hour, which includes stars of street football such as Thierry Henry and Edgar Davids, looking for the biggest stars throughout the world ((USA, England, Argentina, Spain, Brazil, Netherlands, Ghana and South Korea)). The series will end in July with a match in 4 x 4 in the shadow of the Rio World Cup. Jonathan Hock will lead the series and Mike Tollin and Mandalay Sports Media deal of the production. Each episode will be available in June through Xbox Video on Xbox One, Xbox 360, Windows 8 (PC and Surface) as well as Windows Phone 8. Bonnaroo: Music festival Bonnaroo may be followed by Xbox Live users from June 13 to June 15 with live concerts. It will apparently be an application to download, which will also allow for interractions with his friends. Signal to Noise "/" Atari: Game Over: it is a series of six documentary films. "Signal to Noise" will examine how modern technology has radically changed the way we interact with the world in which we live. "Atari: Game Over" (the name is not final) will tell the story of the famous Atari company and his E.T. game including millions of copies have not been sold and buried in the small town of Alamogordo, New Mexico. This documentary will be available exclusively on Xbox 360 and Xbox One in 2014. Humans: As we have said in our previous article, it is an English adaptation of the Swedish series Real Humans. This will be implemented in eight hour-long episodes will happen on British screens for the first time on Channel 4 in 2015. The cast will begin in may 2014 and will begin production this summer. Halo digital feature: 343 Industries and Scott Free Productions will come out at the end of the year a digital project Halo (no more details for the moment) produced by Ridley Scott and David Zucker. Sergio Mimica-Gezzan ("Battlestar Galactica," "Pillars of the Earth", "Heroes") will take care of the direction. Deadlands: The script is based on the success of Shane Lacy Hensley role-playing game. It is a story starring the dead bandits, wizards, mad scientists, secret societies in a very strange Western region. Extraordinary Believers (provisional title): it is a show innovative stop-motion (frame by frame) with Stoopid Buddy Stoodios, the creators of Robot Chicken. Fearless (provisional title): this is a series that is currently in production of a pilot with Paul de Gelder, a Minesweeper, and diver of the Australian Navy, which has lost several members after a shark attack. There mission is to help people who risk their lives to make the world better. Machine Gun: Xbox Entertainment Studio has acquired the rights from Machine Gun which is a thriller police officer isssu of the bestseller by Warren Ellis to be the producer. Brett Conrad ("The Killing," "Sons of Anarchy", and soon "Marco Polo") has signed to write the script for the pilot episode that speak of a detective who hunts down a serial killer. The latter is related to the mysterious weapons used in the infamous murders of New York. Untitled JASH Comedy/Variety Half Hour: It's a comedy developed by Xbox Enternainment and JASH, the comedy collective founded by Sarah Silverman, Michael Cera, Tim and Eric and Reggie Watts. Each week, a different actor will present a show featuring unsung talent. Sarah Silverman will present the episode pilot and Daniel Kellison (Late Show with David Letterman,""Jimmy Kimmel Live,""Crank Yankers") will be the Executive producer. For the moment, there is only the driver that is signed and filming begins in June. Winterworld: Xbox Entertainment Studios and IDW Entertainment co-develop an event series based on a live-action Chuck Dixon and novel Winterworld de Jorge Zaffino in which our world is frozen between the two poles. The surviving humans have formed tribes who fight, enslave and trade with each other to survive the endless winter. Ted Adams and David Ozer of IDW Entertainment, and also Rick Jacobs as Dave Alpert of Circle of Confusion ("Walking Dead") are executive producers. This week allows us to finish April with a release on Xbox One and the Xbox Live Arcade and start the month of May with another output that should concern all likelihood the Xbox 360. Child of Light is created by a small team of industry veterans , Ubisoft Montreal . The game uses the graphics engine UbiArt Framework in which he will take us on an epic adventure in the magical world of Lemuria , worthy of the great classic fairy tales . It will solve puzzles , engage in combat in turn inspired by the classic Japanese RPG and explore a mystical realm . Price : 19,99 € . We find Peter Parker will learn more about the motivations enemies to progress in his quest and find the responsible for the death of his uncle man . The game comes out in parallel in the film where many villains will make every blood New York. 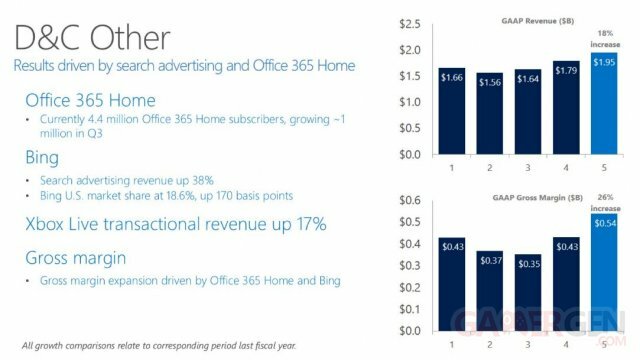 It was during the announcement of the third quarter balance sheet of the Microsoft CFO , Amy Hood, is back on the increase in income Xbox platforms. She took the opportunity to give more information on the use by consumers of the new Xbox One and promised better services, especially outside the United States. One Xbox has sold more than five million units since its launch and the enthusiasm was strong because players spend about five hours a day on their console. 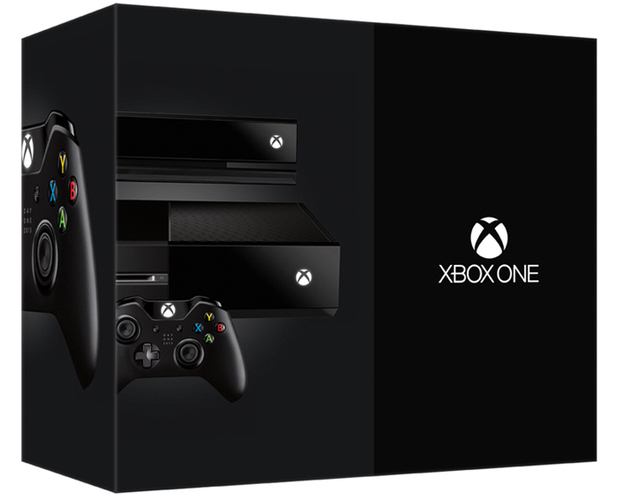 We will continue to offer the complete service for the Xbox One, especially for markets outside the United States. The Xbox 360 has exceeded our expectations this quarter , and on this platform, Xbox Live members continue to use the service with a revenue increase of 17% of transactions . Good news for our Xbox that will continue to bring us a range of new games and services in the coming months . And you ? How much time do you spend on your console every day? Microsoft has just released its results for the third quarter of the fiscal year to March 31, 2014. The Redmond company is performing better than expected, but still down from last year . 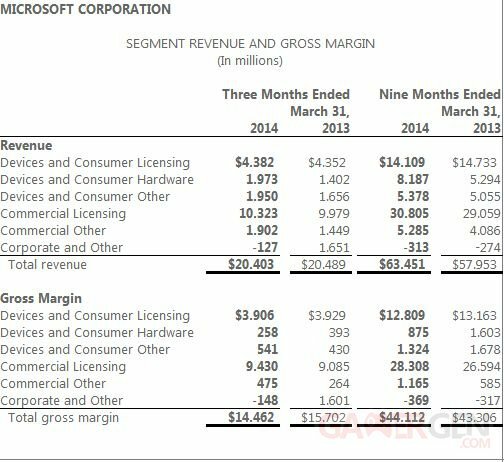 In fact , Microsoft announced a net profit of $ 5.66 billion ( € 4.1 billion ) , down 6.5% compared to the same period in 2013 ( 6.05 billion dollars). However, these figures are better than expected as analysts had reported a turnover of 20.39 billion for the third quarter and Microsoft finally appears 20400000000 . Yes, it is little more , but it must be emphasized . Regarding the video game industry and Consumer Device announced it sold more than 2 million Xbox this period , 1.2 million Xbox One, for a turnover of 8.3 billion dollars. To recap, Microsoft recently announced that shipped 5 million Xbox One resellers (see : Xbox One: 5 million sales Titanfall is the best selling game in March ) ... face to 7 million PS4 . Since the release of the Xbox One, many people wonder why Microsoft are simply not borne the features of the Xbox 360. Major Nelson has tried to answer the question on Reddit where he explained that the U.S. giant would " add more features to the Xbox One - some who were on Xbox 360 and others that are only possible on Xbox One." He simply explained that it is impossible to make a "CTRL + C" ( keyboard shortcut for copy) the code of the Xbox 360. 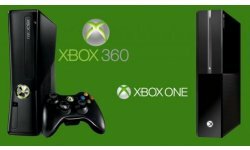 You must remember that the Xbox 360 is one that has evolved in just over 10 years very mature platform. During this time , we have added TONS of new features . 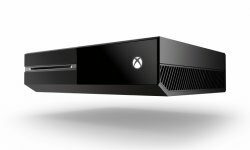 Xbox One has a brand new architecture with which we can not just add the source code that has been done on Xbox 360 with a magic wand . Things do not work that way. It came in response to a question about the lack of evaluation on One Xbox versions , but Microsoft had insisted he would not be imposed on developers to provide demos. Indeed, due to the large size that they could take on the hard disk of the new generation and especially the time it would take to download, this idea was abandoned. On his side, Phil Spencer responded to a question about the monthly updates of the Xbox One, it seems that E3 is also rich in ads on this subject. @XboxP3 Beyond games, will MS have any major features or services to announce for the Xbox One at E3? @Nicodemus9 We will be talking about our monthly updates going into E3, I'm spending a lot of time with team lately prioritizing features. As you know, Microsoft Points will gradually disappear as they are replaced trade for many months by gift cards Xbox (which you can buy from the Microsoft Store, for example). What you do not probably know is that the points you add seem to have an expiration date. A date is 1 June 2015 as you will notice here that is confirmed on the site faQ Xbox.com. Announcing the end of Microsoft Points, the American manufacturer had announced that the "amount added to your Microsoft account will expire one year after the date of card usage and Microsoft Points codes." It seems that Microsoft wants to get rid as soon as the last card still in service. You are now warned: it'll one year, one month and ten days to settle your account. 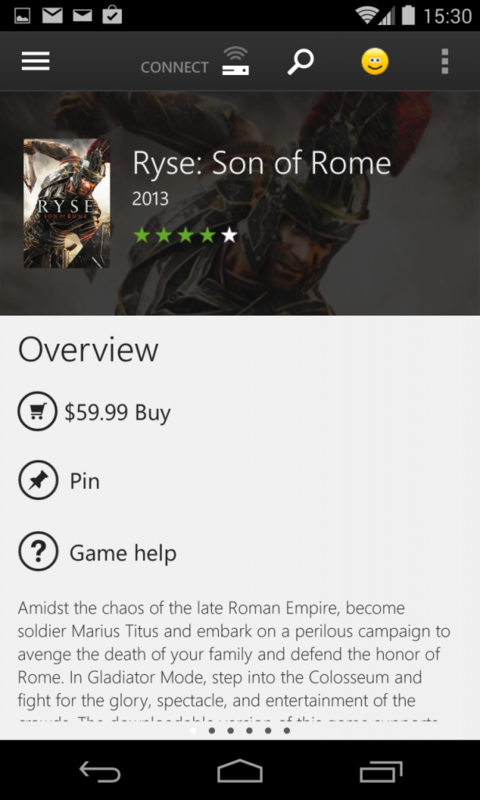 Purchases outside the Xbox One possible soon ? Since the launch of the Xbox One, we are still waiting for Microsoft to put in place the Xbox PC Store for the content of the latest console from Microsoft via Xbox.com. Indeed, if all games can be found on a specific section, this is not the case with other content such as downloadable content , demos etc. as is the case for the Xbox 360. It is therefore impossible to retrieve the content in question within through its console. Since the presentation of Frank Savage at the Build conference , where it presented the architecture of the Xbox One , things become clearer . During the first few months of the console, it was reported three operating systems that ran simultaneously on the console: Windows 8 , the primary operating system console and another that served as a bridge between. This system is basic and is primarily responsible for the console to turn distributing tasks to different components in addition to managing safety ( ie permissions for launching programs , a sort of hypervisor ) . However, this is not the RTOS rests launching applications or game ( it only gives the green light ), but another separate system. 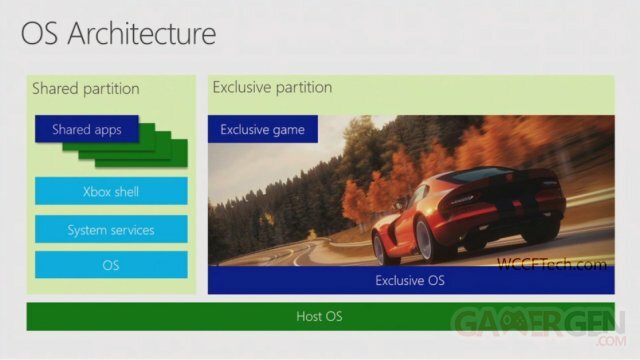 Windows 8 is present on the Xbox One and in a state '' '' almost identical to the PC version ( not visually , but at the code level ) that we already know. W8 is responsible for audio , network features, shared applications (Blu -ray , TV, etc. . ) Interface and graphical design . 3. Windows 8 ( again) - Exclusive OS . For some components such as the network (notifications / group of friends / messages) , it is possible that the OS makes Exclusive Appeal for a moment the Shared Partition. That draw from all this ? In view of the similarities with the PC ( same OS , same x86 ) , it would be very easy to port applications or games on Windows 8 certified Xbox One. Only two restrictions apply: you must still some degree of optimization to ensure good performance and most importantly, it requires a validation upstream from Microsoft. Because if the Xbox One has Windows 8, it is still a more closed and less permissive than its sister dedicated to PC version (which is normal for an OS console) . In other words, the user does not have the last word . Beyond the hardware or functionality of consoles, which makes the salt of the latter are primarily games. A console without games is very nice but it does not make much sense. Besides that the PS4 and Xbox One has the largest catalog of titles? Reply with graphics. The Internet has made ​​deadpixel an infographic listing all the games released since November on PS4 and Xbox One. If this long list to assess the quantity and not the quality of games, we can notice that the PS4 has to date a much larger catalog of titles. Mainly due to independent games available for download on the PlayStation Store. Destiny is almost finished , players will be "transported" ! "I think the fans of Bungie really expect to hear the music of Marty, Mike Salvatori, C. Paul and Paul McCartney in the game It will really be a great and wonderful experience. People will be transported not only by the activities and stories in the world of Destiny but also the views of the surroundings and the wonderful sounds and music. We have a fantastic team. We are almost ready to deliver the game There are still a lot of finishing , refining and adjustment but a big part of the game is already over. " Everyone is beautiful, everyone is nice . Many sites have recently been invited into the premises of the studio , one image previews come in the days and weeks to come and tell us a little about how articulates this new open world FPS . It is on Reddit that Major Nelson defended the fact that the Xbox One was delivered amputated many present features long time on Xbox 360 and coming gradually through updates. As is the case with the latter finally bringing friends connection notifications. "It is in the list of things to do. In your opinion, what can we expect knowing that the removal of the mandatory demos had been requested by independent developers for reasons of economies? The charts NDP to the month of March, 2014 for the US market are revealed and confirmed the leadership of the PS4 with the Xbox One; the latter has sold 311000 units. 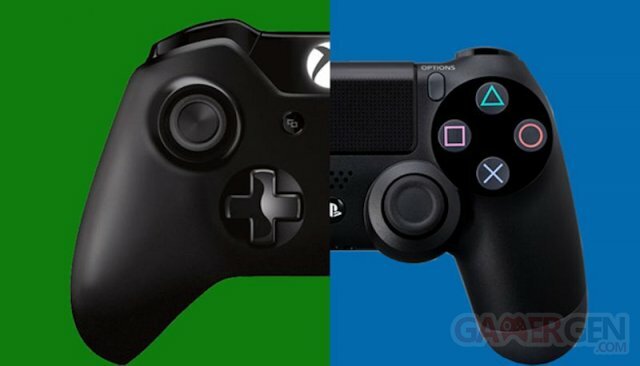 Sony had announced a few days ago that the PS4 is over more than 7 million units worldwide, Microsoft today announced having passed the 5 million for the Xbox One and emphasizes a 60% improvement than the Xbox 360 at the same time after its launch. The Xbox division said: "of course, we are just starting with this generation and the coming months will bring several new ads you'll love" and adds: "the team will continue to provide improvements regularly and new features based on feedback from users through the frequent updates of the system. "We look forward to sharing with you more games in June at E3". Microsoft reveals other figures including the fact that it sells for 2.9 games by console and that it is sold 1.4 million games Xbox One during this month of March. On Xbox 360, it has passed to 110,000 units last month and 2.7 million 360 games have been sold. And finally, Liam Callahan from NPD says: "When comparing the first five months of the One and PS4 Xbox sales in the first five months of their predecessors, total sales Xbox One and PS4 are increases by up to 60%". These figures are encouraging and it shows that the market is revived with the release of this new generation even if everything was not perfect at launch. This gave even a positive sales of accessories since there is an increase in sales of 4 percent in March thanks to the new consoles. While yesterday Sony announced have passed not less than 7 million worldwide (see: PS4: 7 million units sold in the world), it is now the turn of Microsoft to communicate a little in relation to the sales of his machine, but the lighthouse Titanfall game. 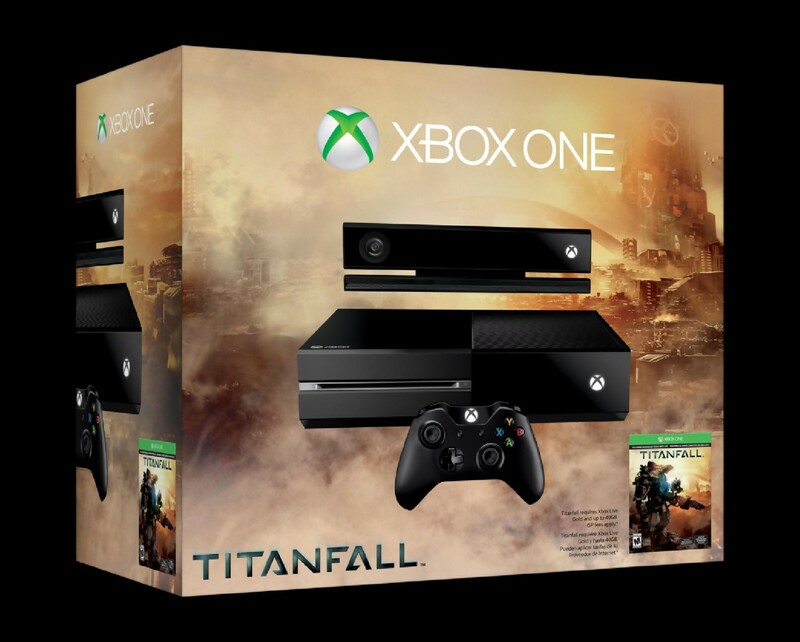 Indeed, one learns on the official Xbox website Titanfall is (unsurprisingly?) the game that has the more elapsed on Xbox One in March. Unfortunately, no figure has been given, and if based on site VGChartz, the game would have found about 1.35 million policyholders. 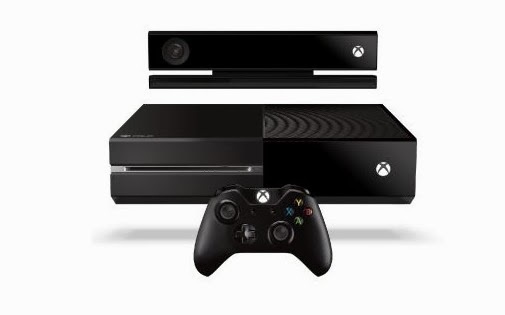 But the big information for Microsoft on its latest console. Indeed, the manufacturer proudly announces have sent no less than 5 million machines to resellers, without specifying how many consoles were actually sold to consumers. However, it still gives us a small ideas, sales so we know now the Xbox One accuses approximately 2 million sales of delay on its competitor, the PS4. Let us not forget, however, that the machine is available in 13 Territories. Sony Computer Entertainment is rubbing their hands at the moment. And because, more than seven million PlayStation 4 have passed around the world. NPD Group delivers some figures concerning sales of consoles and games in the United States. Side hardware, and for the month of March, it is the machine of Mister S. that was the most coveted; more than 370,000 units elapsed, against 311 000 Xbox One. About various productions, and we learned it through Microsoft, it is Titanfall which dominates the charts followed by inFAMOUS: Second sound. As we can see for months, hardware sales saw strong growth in March 2014 compared to March 2013.